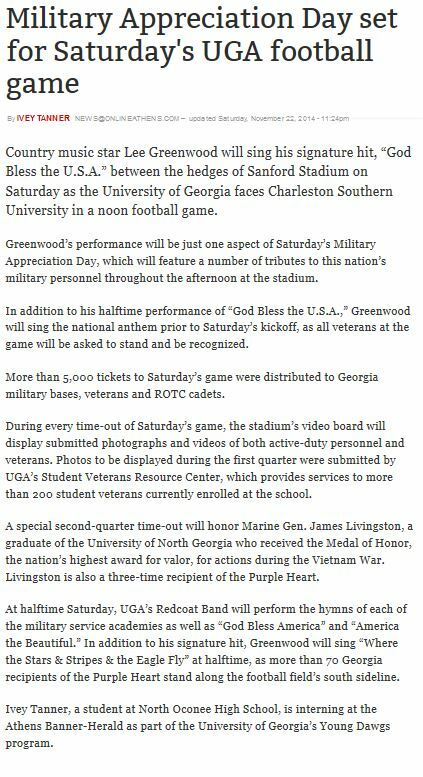 In 2014 at the Charleston Southern game on November 22, the University of Georgia honored another of our Nation's and State's heroes. 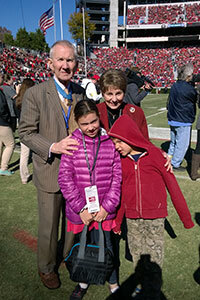 General James Livingston, a veteran of the Vietnam War was present for the ceremony. 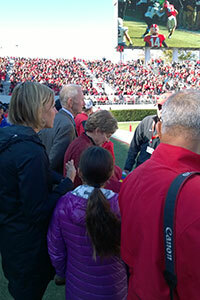 This was an important day for all Georgians and, UGA fans were treated to a special event when General Livingston and his family joined is for the day. 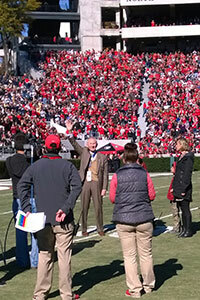 As is appropriate for one of our Nation's most decorated heroes, General Livingston was given a standing ovation. 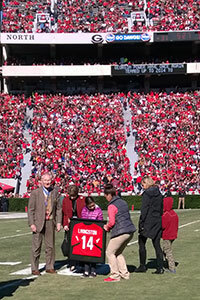 A special day for all in the Bulldog family. In addition to his Medal of Honor recognition, General Livingston is one of our Nation's most highly decorated veterans. You can read more about General Livingston's career by clicking here. 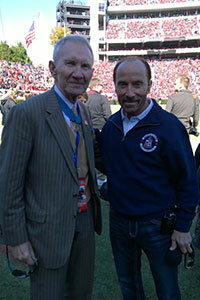 Also at the game was Lee Greenwood who brought additional cheers with his song "God Bless the USA." Mr. Greenwood works tirelessly in support of Veteran's causes and he and General Livingston often work together. The Athens Banner Herald also gave the event special coverage which you can read here. To see a brief video of the ceremony click here. 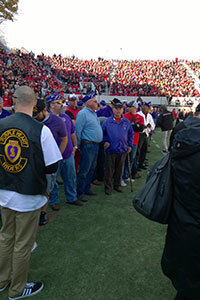 Also honored in the same ceremony was a large contingent of Purple Heart Recipients from all wars. This part of the event offered these veterans an opportunity to be recognized for their service and sacrifice, but also an opportunity for General Livingston to thank them for their contribution to our freedom and way of life. James Livingston's early assignments included service as a platoon commander, intelligence officer and as a Recruit Training Regiment series commander. Promoted to captain in June 1966, Capt Livingston served as the Commanding Officer of the Marine detachment aboard the Aircraft Carrier USS Wasp, before joining the 3rd Marine Division in the Republic of Vietnam in August 1967. On May 2, 1968, while serving as Commanding Officer, Company E, 2nd Battalion, 4th Marines, he distinguished himself above and beyond the call of duty in action against enemy forces, and earned the Medal of Honor. You can read the details of General Livingston's heroism here. He returned to the U. S. in November 1968 and completed the Amphibious Warfare School in Quantico, Virginia. He was presented the Medal of Honor on May 14, 1970 by President Richard Nixon. After his second tour in Vietnam, he served as an instructor at the U. S. Army Infantry School, Director of Division Schools for the 1st Marine Division, and later, as S-3 of the 3rd Battalion, 7th Marines. In March 1975 he returned to Vietnam and served as Operations Officer for the Vietnam evacuation operations which included Operation Frequent Wind, the evacuation of Saigon. He then commanded the Marine Barracks, United Kingdom, London, and served as Commanding Officer, 3rd Recruit Training Battalion and then as the Assistant Chief of Staff for Operations and Training at the Marine Recruit Depot, Parris Island, South Carolina. During this period, he earned a master’s degree in Management from Webster University (1984). 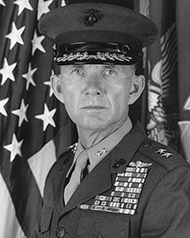 He then served with the 2nd Marine Division and commanded the 6th Marines before joining the Joint U.S. Assistance Group in the Republic of the Philippines. Following advancement to brigadier general on June 10, 1988, he served as Deputy Director for Operations at the National Military Command Center in Washington, D. C. During Operations Desert Shield and Desert Storm, Gen Livingston commanded the Marine Air Ground Combat Center, 29 Palms, California and developed the Desert Warfare Training Program. After command of the 1st Marine Expeditionary Brigade, he was advanced to major general on July 8, 1991, and assumed command of the 4th Marine Division. In July 1992, he assumed command of the newly created Marine Reserve Force, and continued through its reorganization in October 1994, with its new title, "Marine Forces Reserve". General Livingston is a graduate of the Amphibious Warfare School, the Marine Corps Command and Staff College and the Air War College. He is one of Georgia's most decorated veterans in addition to being a recipient of our Nation's highest award for valor, the Medal of Honor.